The Flea Theater and The Chelsea Art Museum announce the world premiere of ‘TWAS THENIGHT BEFORE, ten-minute works by playwrights Christopher Durang, Len Jenkin, Roger Rosenblatt, Elizabeth Swados and Mac Wellman. The Flea commissioned this group of award winning writers to create short works using the famous holiday poem ‘Twas the Night Before Christmas by Clement Clark Moore (1779 – 1863) as their inspiration. This evening of spirited riffs on the holidays will feature a new company of Bats, the resident company of emerging artists at The Flea. Jim Simpson, Artistic Director of The Flea, annually auditions close to 1000 young actors for the company which this season will feature 40 new and returning Bats. 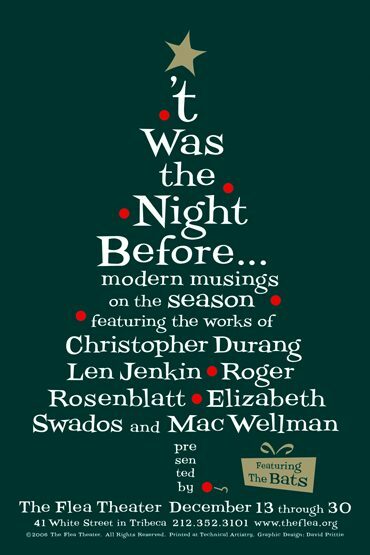 ‘TWAS THE NIGHT BEFORE includes “Not a Creature was Stirring” by Christopher Durang, “Christmas Song” by Len Jenkin, “Away in the Manger” by Roger Rosenblatt, “Holiday Movies” by Elizabeth Swados and “Before The Before and Before That” by Mac Wellman. The plays will premiere at a gala event held at The Chelsea Art Museum, originally the home of the poet. While Durang takes us places ‘Twas the Night Before Christmas never imagined, Jenkin recalls a Christmas eve as only Jenkin can. The political pundit and social commentator Rosenblatt gives us a manger scene unlike any other. Swados sends up every holiday movie ever made and every toy ever given. Finally, the “reigning Dark Prince of the Abstract” Wellman explores the notion of before. Get ready for an evening of holiday cheer Flea style. Jenkin and Swados will direct their own pieces and The Flea welcomes up-and-coming directors Kip Fagan (directing Durang), Jason Podplesky (directing Rosenblatt) and Amanda Wright (directing Wellman). ‘Twas the Night Before features sets and lights by Kyle Chepulis, and costumes by Sarah Beers and Heather Dunbar. ‘TWAS THE NIGHT BEFORE premieres December 4 at special gala performance and dinner dinner celebrating the playwrights and the company. It will be held at The Chelsea Art Museum (556 West 22nd Street). Tickets are $1000 and are available by calling 212-226-0051, ext. 101. ‘TWAS THE NIGHT BEFORE then moves to a limited engagement at The Flea running December 13-16 at 10pm and December 20-30, Wednesday – Saturday at 8pm & 10pm. Tickets are $20. For tickets call 212-352-3101 or visit www.TheaterMania.com.